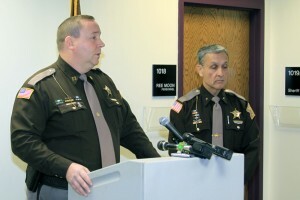 Howard County Sheriffs Department Captain Jerry Asher and Sheriff Steve Rogers conduct a press conference discussing the Kokomo school bus incident. A Kokomo-Center Township Schools bus driver was stopped by Howard County Sheriff Deputies after driving erratically on US 31 around 9 a.m. shortly after having its athletic team passengers removed from the bus by the coach. After stopping the bus at the Gas America at the intersection of Indiana State Road 26 and US 31, deputies arrested Theresa Mast, 56, of Kokomo, on suspicion of drunken driving. Mast was originally transporting the Kokomo High School girls swimming team to an event in Richmond. Following an interview with deputies, Mast was transported to St. Joseph Hospital where tests showed she had a blood alcohol level of .20. She was taken to the Howard County Criminal Justice Center and arrested for Operating a Motor Vehicle while intoxicated. Mast has been placed on unpaid leave pending a recommendation to the Kokomo School Board for termination. A Kokomo Schools spokesman said there were no athletes on the bus at the time of the arrest as the coach recognized the situation and had the students board a second bus transporting the boys swim team to the same event. The bus was en route back to Kokomo when it was stopped. “Two Kokomo-Center buses containing student-athletes and coaches departed from Kokomo High School at approximately 8 a.m. to travel to an athletic event. At approximately 8:30 a.m., the driver pulled into a safe area off (US 31) south of Howard County after concerns expressed by a coach. The student-athletes and coaches were transferred safely to another bus, which transported them safely to their event. “While no students were impacted by this unfortunate situation created by an individual driver’s decision, all student-athletes and available parents were updated concerning the situation at the conclusion of their athletic event. Deputies and Kokomo-Center school officials are working to retrieve evidence and identify all potential witnesses in this matter. Anyone with information about this incident should contact the Howard County Sheriff’s Department at 765 457-1105. UPDATED, Dec. 5, 2011, 10 a.m.: The Howard County Sheriff Department has charged Theresa Mast with one count A Misdemeanor Driving a Motor Vehicle While Intoxicated (with blood alcohol level above .10) and one count D Felony Driving a Motor Vehicle While Intoxicated (with passengers under the age of 18). She is being held without bond at the Howard County Criminal Justice Center and will face a video arraignment Tuesday. In addition, Howard County Sheriff Steve Rogers said the bus traveled from Kokomo High School, through Tipton County, and stopped in Hamilton County at the Gas America on US 31 in Bakers Corner. He indicated that Salena Hawk, a parent of a swim team member, was following the bus in her private vehicle and noted the erratic driving by the bus driver. Hawk then contacted KHS girls head swim coach Donita Walters, who was aboard the bus, via cell phone to inform her to have the bus stopped. It was at the Bakers Corner Gas America that the 14 student-athletes were removed from the bus and to the safety of a second bus containing the boys swim team. Rogers and HCSD Captain Jerry Asher said that after unloading her passengers, Mast returned to Howard County and was already stopped in the parking lot of the Kokomo Gas America when sheriff deputies approached the bus, which resulted in a field sobriety test. Deputies were already looking for the bus due to at least one 911 call and contact with school officials when they located it at the Kokomo Gas America. Rogers said Mast does not have a previous criminal history and he cannot remember investigating a case like this in during his long law enforcement career. Because this incident involved children under the age of 18, the Indiana Department of Child Protective Services is also investigating and additional charges, including child neglect, could be forthcoming. The Howard County Prosecutor has been notified of the incident but has not reviewed the case of as Monday morning. For more on this story, see the Dec. 5 edition of the Sports Journal of Central Indiana. This entry was posted in High School, Kokomo, Wildkats. Bookmark the permalink.